The WI movement is the largest voluntary women's organization in the UK and it exists to educate women so that they are enabled to play an effective role in their communities, as well as expanding their personal horizons and developing important skills which they can pass on. The group is open to membership from Middle Rasen, Market Rasen and the surrounding areas. Sue's Yoga group offers a "health boost" and a "Touch of the Himalayas"
When I finished work with the NHS as a Health Visitor, I decided to go to India. On my bucket list was to experience an ashram, where the students rest, contemplate and practice yoga. It was there I met a lovely Korean teacher who told me I should become a teacher of yoga as I have the right qualities needed for the role. Much to my surprise, I just smiled and put it in with my memories of a wonderful trip. This thought grew, and since then I have completed my foundation studies in yoga with the British Wheel of Yoga, and I am at present a student on the Diploma teaching course. I did return to the Himalayas, to complete my Traditional Himalayan Yoga Training level one. And have started to run classes in the village. I like to combine my knowledge as a nurse and yoga teacher to build a healthy body and a still mind. The exercises are suitable for all ages, and the healthy benefits are amazing. It strengthens joints and glands, improving posture and using the breath helps with any respiratory problems. I love the holistic practice of the yoga to help people help themselves towards a healthy life style. It is a real privilege to share some of the secrets of what the Himalayan Tradition has practiced for many years, and bring some of the essence of India into a Lincolnshire Village. If you are interested in coming along to try something new for 2019 please call Pat MacRae on 01673 885356/07449772089. The Women's Own group were captivated when their recent speaker Helen McLaughlin spoke about her son's journey to the Special Olympics World Games. The group were thrilled to see the amazing display of photos and the many medals that Andrew has won in gymnastic competitions leading to his place at the games. In addition to Andrew's accomplishments in gymnastics he has also achieved his Duke of Edinburgh Bronze award whilst at school in Cheshire . It is amazing to discover that Women's Own group in Middle Rasen have been holding weekly meetings every Wednesday afternoon since 16h October 1940! When the group was first formed there were three Chapels in the village and the plan was to meet at each Chapel in turn. Initially a president was elected with three vice presidents, one from each Chapel. Tea and biscuits cost 1d with six ladies on the “tea committee”. A collection at the first meeting amounted to 2s 8d. Vera Hankin's mother and grandmother were two of the founder members, following family tradition Vera joined the group in 1952. During the 60 years that Vera has been a member she held the role of treasurer for 42 years, and president for 25 years giving up her role recently as treasurer and remaining as president. 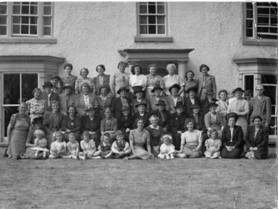 Throughout its lifetime membership has fluctuated, especially during the war years when lots of women went out to work. The group continues to thrive, with twenty four members who attend regularly to enjoy guest speakers and the wide ranging activities that take place. The group hold an annual charity event where they raise money for children's or local charities. If you are interested in joining the group they meet every Wednesday at 2 pm at Middle Rasen Methodist Church. If you are a little apprehensive of walking in on your own give Alice a ring on 01673 843256 who will arrange for some to meet and welcome you. We are a small group of people who enjoy photography; and meet once a month on 2nd Wednesday in the Village Hall, Middle Rasen at 2.30pm. BEER FESTIVAL at the Market Rasen Football and Cricket Club on 4th and 5th May, 12.30 – 11pm. Adult entry £3.00 & accompanied children go free! Bouncy castle, hook-a-duck, food available .... Fun for all the family! The group plan to meet the last Friday of the month until 28th June 2019, when we take a summer break. Its a new group so please check the Community Spirit publication and WhatsOn that month for any last minute changes. Together we learn creative skills, meet new and old friends, and share fresh ideas. Everyone brings what they want to make, and if you haven't got any ideas, we help each other to create! Bring button boxes, knitting kits, fat quarters and sewing machines if you wish – whatever your latest project is - and create miracles together in an informal, relaxed setting. Disabled facilities are available and if anyone needs a lift, or further details, please call or text 07443 415542. 7- 9pm Friday April 26th at the Church Hall. Bring your latest project! Invite a friend? We have been supporting and orphan care project called Shine Malawi and some hobbyists are making newborn clothing and blanket squares to send out with the UK team in June. Recent floods have devastated the country, leaving many families homeless. Thanks to Hobby Club and after-Church coffee time donations during March to the "Shiny Jar", we were able to send a cash donation of £60 (so far, with more pledged) to the relief effort. Thank you so much for this. More details, call 07443 415542. Look forward to seeing you. Helen, Theresa and Jane. We have had a good break in December and are pleased to say that we will be serving the usual hot drinks and homemade cakes in 2019 from Thursday 3 rd January in the schoolroom at Middle Rasen Methodist Church. We send our best wishes for a Happy New Year and look forward to catching up with everyone. Over 60's Keep Fit @ Braemar Court. Kate Roberts tells us "We are an enthusiastic, self help, group, mainly painting in Oils but any medium can be used by members. Our group encompasses all levels of artistic skill from beginners to semi-professionals. New members are always welcome. During term time, we meet in The Catholic Schoolroom, Market Rasen, on Fridays 2 – 4 pm. Please contact Kate: 01673 842703 for more details. Our members are currently exhibiting their work at Caistor Heritage Centre for the month of June 2018." This site awaits an update from the Watercolour Group in Market Rasen. 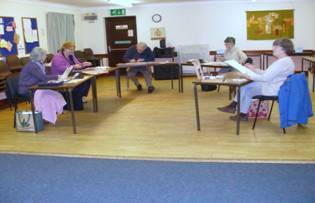 The art group was started in 2003 by Ronnie Morten and for the first 2 years the group met in Market Rasen. Very sadly, Ronnie died but the art group that he started has carried on and to this day they still meet once a week. They now meet in Middle Rasen Church Hall every Monday evening at 7.45 pm and finish at 9.45 pm. There are 7 regulars in the group, sometimes as many as 10 come along. It costs £3 per session or £10 paid in advance for 4 sessions. All artists supply their own materials. This is a group of experienced artists who all work individually on their own pieces of work, often advising and encouraging each other and giving each other tips. Occasionally they do invite other artists in to demonstrate techniques in specific areas to continue developing their skills. The wealth of talent in the group is amazing with specialists in oils, water colours, pastels, sketching all covering a range of subject areas. They exhibit their work in Market Rasen and Newton by Toft annually. In her article Moira Garrick tells us this was an art group and not an art class. There is something very poignant about standing in the bell tower ringing bells that have rung out for thousands of weddings and church services for hundreds of years. Bell ringing keeps alive one of England 's oldest traditions and Middle Rasen village should feel proud that its Church has such a wonderful ring of bells. I started bell ringing four years ago and have found it to be a very rewarding hobby. It is not just about ringing peals. I also enjoy the company and fellowship, especially at the Monday night practice sessions, which begin at 7:30pm. We always have a good laugh. On 30th November, the Middle Rasen ringers, accompanied by two friends from Grimsby took up the challenge to ring their first peal of ‘Plain Bob Minor', to mark the beginning of the Christian season of Advent. It is a peal that takes approx two hours and forty-five minutes to ring and is the first to be rung by a local band for many years, and on the new Millennium bells. As our Tower Captain, Stephen Wright, points out, “Peals are rare to hear as the complicated method involves 5040 different changes. The length of time to ring a peal requires not only a great deal of concentration, but is very tiring, and is attempted only by a band of dedicated and proficient ringers”. We will also be ringing in the New Year, beginning at 11:45pm on New Years Eve. It is now sixty-three years since I began the ancient art of bell ringing. I first learnt to ring in 1947 with my sisters Peggy and Elaine. It was in response to an appeal for a new band of bell ringers by Norman Chaddock , the tower captain at our local church in Whiston, near Rotherham . I became a member of the Yorkshire Association of Bell Ringers in 1948. Ringing has always been quite a family affair, with mum and dad providing tea for the regular meetings of the Yorkshire Association, and my three daughters all learning to ring and the eldest being a member of the Surrey Association. Over the past sixty years I have rung in many, many churches across the country. With around 5000 churches with their own sets of bells, bell ringing provides the opportunity to visit some beautiful churches and historical buildings. Every church and its set of bells are different, some presenting quite interesting challenges. Once you know how to handle a bell you will receive a warm welcome at any tower, whatever your ability. Being a committed service ringer, my aim has always been to ensure the church bells are rung for church services throughout the year and on special occasions. I started ringing in Lincolnshire following the augmentation of eight bells in Caistor Parish Church , and rang regularly at there until I became involved with the re-hanging of the bells at Market Rasen church. Since then I have actively supported and encouraged ringing in Market Rasen, Tealby and Claxby, and latterly here at Middle Rasen. Some of the highlights for me have included ringing a peal for the funeral of King George VI in 1951 and ringing for the Civil Defence Core during my national service in Surrey during 1953-54. In Lincolnshire the highlights have been co-ordinating the re-hanging of the bells at Middle Rasen and training a new band of Middle Rasen Ringers. English style church bell ringing is a fascinating activity that requires physical co-ordination, a sensed of rhythm and good listening skills. It provides mental and physical stimulation, along with the social aspect of working with other ringers. 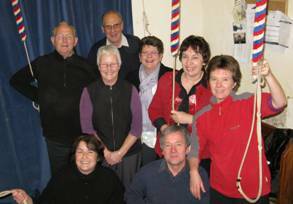 Ringers represent the whole range of society, male and female, young and old and from all walks of life. Ringing is a genuine all-age activity and you are judged by your ability not your social standing whether you are 8, 18 or 80. The ringers of St Peter & St Paul are typical of many bands. We now have a band of eight ringers at Middle Rasen but newcomers are always welcome to learn the art. If you are intrigued, want to learn more or just ‘have a go', do come along to our practice night on Mondays from 7.30pm. So if you are 12 years or older and would like to try your hand at this most joyful of hobbies why not pop over on a Monday night and have a go. We would love to see you. All Clubs would welcome New members & Helpers. Just turn up or telephone contact telephone number. Meet on 1st and 3rd Wednesday in Middle Rasen Church Hall, 1.30 – 3.30pm Everyone Welcome! Mondays 1.30 – 4.30pm & Thursdays 7 – 9.30pm. All Welcome! 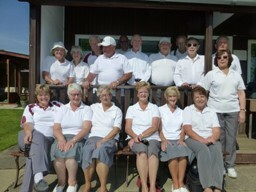 We are desperately in need of more members to come and join our community minded Bowling Club. We are the only outdoor sporting activity left in the Village now that the football and cricket clubs have folded. We are short of members and would hate to see it disappear through lack of support. 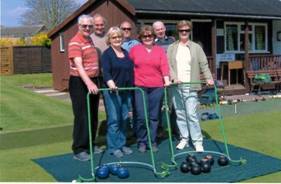 Bowls is a sport where most members of a family can play together on an even keel. If you would like to come down to our Club on or after the start of the season we would be very pleased to see you and if you've never bowled before there are members willing to show you how. COME AND HAVE A GO to see if it's for you. Our season (weather permitting) will start on Saturday 13 th April. Alternatively give me a phone call on 01673885451 Rich Wright (Chairman). With the evenings now drawing out and the wonderful smell of freshly mown grass in the air it must be time to enjoy a good relaxing games of bowls. When we moved here last June I bought a set of woods in anticipation of an occasional game on the Middle Rasen bowling green , which is but a stones throw from our house. I didn't get around to it last year, but now that the club secretary Ken Miller has sold me a pair of bowling shoes (which have to be flat) I no longer have an excuse, especially as the green re-opens this month for its 59 th year. The picture below shows the first wood being bowled on the green by bowling veteran Mr G.H. Timms aged 84, on 7 th June 1950 during the first match between Market Rasen and Middle Rasen, which Middle won by nine shots to six. It was a Wednesday evening and has set the pattern for match days ever since. The club president is Maurice Higham, who kindly allowed us to use this picture from his extensive collection, and whose father had first placed an advert in the Rasen Mail on 3 rd July 1948 asking for anyone who may be interested in forming a bowling club to contact him. The first meeting was subsequently held on 25 th Feb 1949 and the first grass seeds for the green were sown later that year on 15 th September. The green is now owned by Gordon and Ann Veal, whose house overlooks the green and are both long time members of the club. It has been in the family for some time as Gordon's father had bought the green from its original owner Mr Roe. The former "Lunch Club" was opened to members in January 2002 and offered the use of the Methodist Church. It was open to anyone living in a radius of 5 miles from Middle Rasen. It has functioned regularly twice a month since then, offering members a two-course meal plus a cup of tea or coffee. 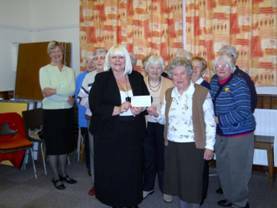 Small gifts brought by the members were used in a small raffle each time to raise funds for the club. Over the years the Lunch Club has been grateful for the help of the cooks and helpers who have worked hard to prepare, cook and serve the meals but recently it has been obvious that our cooks now are unable to carry on for health and personal reasons. As no other cooks have come forward to continue the Club's meals, the Committee met to discuss the matter and decided that the Lunch Club will now have to close. All the members will be asked to endorse the Committee's decision on 13 th September and the final Lunch Club meeting will take place on the 27 th September. The Lunch Club has been a very pleasant social occasion for everyone and we are grateful to everyone who has attended, and those have given their help and support each month in so many ways. Members enjoyed their final lunch together at the Market Rasen Golf Club. They were sorry that the Luncheon Club is ending but they nevertheless had a happy and enjoyable final meal together. It was also a time to say thank you to everyone past and present who had been actively involved with the cooking, serving and administration of the meals. Flowers were given to these persons in appreciation of their contribution to the success of the Club. The Market Rasen Branch of Lincolnshire Beekeepers Association meet at Middle Rasen Church Hall on the first Thursday of the month at 7.30 pm between September and April. 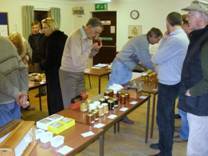 The December meeting was the Fun Honey Show with a wide range of classes for judging. There were a good number of entries in all 18 classes,. This included 8 different classes of Honey Jars, judged by local judge Arthur Adams of Legsby. Arthur carefully explained the process of judging, stating exactly the criteria from each element that formed the basis of his decision in identifying a winning jar. Members and visitors were invited to taste samples from other classes and vote for their favourite. These ranged from honey cakes and biscuits, to chutney's and jams. Other classes included candles and photography with some amazing photos including some of swarms of bees. Market Rasen Beekeeping Club was set up some years ago by Brian Oxborrow, our current Chairman, and the late Brian Ayres. Their aim was to promote beekeeping, provide an opportunity for prospective beekeepers to find out about the craft and to encourage best practice in beekeeping. Those aims remain in place today. Setting up as a beekeeper can be expensive, so it makes sense to find out first whether or not it's for you. There is no better way of doing this than by having a go for yourself and with Market Rasen Beekeepers (MRBK) you can do just that. We have our own apiary; that is several colonies (hives) of bees. Newcomers can learn about the equipment, how to handle and manage the bees, how to harvest and process the honey and will also make valuable contact with experienced beekeepers. In addition we have some larger pieces of equipment that members can borrow. MRBK is a district member of the Lincolnshire Beekeeping Association (LBKA,) which in turn is part of the British Beekeeping Association (BBKA). Membership of MRBK includes membership to both of these organisations and also provides insurance for your own apiary. You will receive regular newsletters and the latest information on beekeeping. In the active beekeeping period, April to August, we usually meet at the apiary at Legsby at 6.00pm to do any work necessary. During the busiest times, May to July, this is often weekly. Sometimes we have evening meetings to process the honey, which we sell to boost club funds. During the winter, September to March, we meet at Middle Rasen Church Hall at 7.30pm on the first Thursday evening once a month, when we have beekeeping talks and some social events. If you are interested in finding out more about beekeeping you will receive a warm welcome at MRBK. For further details please contact me, Carole Raynor, Club Secretary (885326).